Edith L. Moore Nature Sanctuary, Houston, TX. Although Edith Lotz Moore was born in 1884 in Minnesota, her destiny was to come to Texas and create a lasting gift to Houstonians, a gift of solitude and sanctuary now in the heart of busy Memorial Drive at the Sam Houston Tollway. Edith graduated from the University of Minnesota and came to Houston during WWI to do her part for the war by working as a bacteriologist and pathologist at Camp Logan, a military installation in what is now Memorial Park. When the war ended, she went to work for the City of Houston as a scientist and married a milk inspector named Jesse Moore. Even back then, Houston had its scandals. One scam involved Houston dairy farmers adulterating raw milk with hydrogen peroxide to cover up the fact their herds had tuberculosis and brucelosis. She and her husband must have known who had the diseased cattle and knew who was paying bribes to have their milk passed as safe for sale. Edith's high principles did not allow her to tolerate such deceit. Two milk inspectors were fired in the scandal, but Edith did not like the ongoing problems involved with working for the City of Houston. Tired also of the crowding of Houston, Edith longed for rural living. Her husband had been raised on a Texas farm and he too longed to live outside the city. 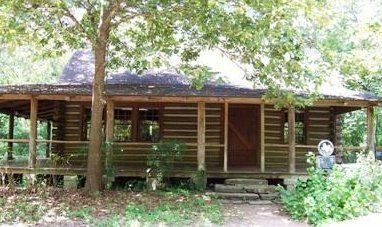 In 1930, they bought several hundred heavily wooded acres and built their dream two-story log house 17 miles outside Houston. They also built a saw mill and lumber yard in their forest. A 24-stall dairy provided additional income. Her husband raised frogs for the finer restaurants in Houston. Edith also had chickens and sold eggs, but the chickens were never on a dinner plate because Edith loved animals and nature and made her home a safe haven. Although the Great Depression after the financial crash of 1929 was deepening, life was very lively at the Moores' country place. Their workmen, some with their families, lived in tents on the property and worked in the saw mill and dairy. Millions of people were out of work and having a job that provided shelter and food was prized. Chickens provided an abundance of eggs and there was a large vegetable garden. Edith wrote in her journal that one snowy Christmas Eve was particularly festive with lanterns in the tents and fires built outside by workers gathered around to socialize and sing songs. A pair of boots was obtained as a gift for a boy who had no shoes. He was so proud of the boots he went barefoot from tent to tent carrying his boots to show them off. He did not put them on for fear of damaging them in the wet snow. In 1935, a great flood destroyed the saw mill and dairy, and nearly killed everyone. They all escaped through a window to the roof on the second floor of the log house as water lapped at their feet. As they waited for rescue by row boat, water-laden debris roared by. Edith spotted a live pig on a piece of tree trunk, headed their way. They managed to reach out and save the pig from the flood. They named him Noah. He became their pet and stayed on to die of old age. The Moores did not rebuild. The only surviving structure on their land was their log house built of old growth trees from the property. It was not long before Edith�s husband, a man with a roving eye apparently, took up with another woman. In time Edith and Jesse divorced. He wanted their forest home, but Edith refused to let him have her sanctuary and Jesse moved on elsewhere. Edith never had children, but she had much love and concern for them. 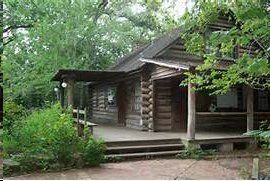 During the Depression, she asked one itinerant worker if his young son, John Fuller, could come in from his cold tent and live in the upstairs room of the Moores' log house and go to school. The father gladly agreed. During the Depression, workers often had no permanent home and they drifted from place to place. When the father moved on to find work elsewhere, his son John stayed on with the Moores and finished high school. He then went on to have a Navy career and retired to Louisiana. When Edith was in her 80s, she knew she had to make provisions for her home and her dogs after she was gone. She offered her property to John Fuller. He thanked her but declined saying she had already done so much for him. As a result of his humble refusal of her generous gift, Houston Audubon would later receive the property. Until the end, Edith found joy and solitude in her sanctuary. An intelligent woman of many talents, she was an artist, writer, singer, song writer, pianist, environmentalist, and teacher, in addition to being a successful medical illustrator and scientist. She loved the yellow jasmine growing around her home in her forest and she loved the birds. When she was 89, she left her home to Houston Audubon Society for all to enjoy. More than ten thousand children a year go through programs and day camps at the Edith L .Moore Nature Sanctuary at 440 Wilchester at Memorial Drive. 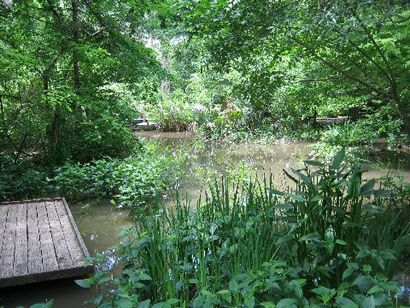 Thousands more visitors enjoy peaceful strolling through the remaining 17.5 acres of Edith's property to enjoy the forest as they watch birds and wildlife, and observe Rummel Creek meander on its way to nearby Buffalo Bayou. Although the Sam Houston Tollway rumbles in the distance, Edith L. Moore Nature Sanctuary is in another time, another place.